I'm finally back with another tutorial! 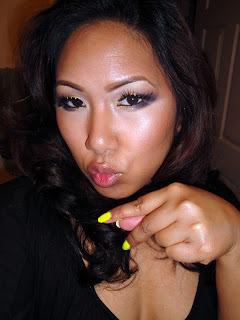 I actually wore this look to the New York makeup show and i've featured it in a FOTD. It's fun and bright and has lots of bling. Check it out! I absolutely love Sugarpill's Goldilux Loose Shadow. It really shines and you don't even have to foil it (apply it wet) to get maximum color impact. 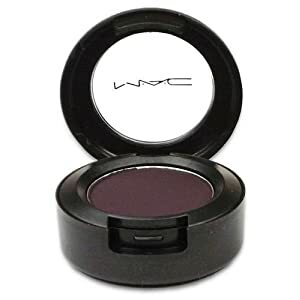 It's always fun to contour with a shade other than black - in this case I used MAC's Shadowy Lady, a deep purple that gives the smokey look with a nice purple tint. It's also easier to blend than the typical black - I suggest trying navys and dark browns as alternatives to black shadow for a smokey eye. And of course, the rhinestone lashes. To get this look, I took a pair of Sugarpill lashes that came with rhinestones and paired them on top of another pair for extra volume.. You could always make your own as well by gluing rhinestones from the craft store to the base of any pair of lashes using clear lash glue. I've also seen a lot of rhinestones that come in strips with adhesive already on the back. I have another tutorial coming soon which features a summery more natural look with a pop of color. Till next time, Ciao Bellas!